Flying Horse Ltd - Who said mounted games are just for children?! Who said mounted games are just for children?! At the riding stables where I rode regularly for a number of years (and where I fell in love with the haflinger breed) we participated at games in every ‘lesson’ – even as adults. The horses enjoyed it and we also enjoyed it. A win-win situation! A few months ago we had an adults games night session at Flying Horse and everyone had an absolute ball, there was so much laughing and I realised how much I missed games! We’re going to be running another session soon and will do so every month or so during the summer season – keep an eye on the events page for details on when they will be running. If you’re not sure about participating – here’s 10 reasons why it would be a great idea to give it a try! And the best thing is – you don’t even have to be on horseback as you can participate in most of the games by leading your horse – a lovely way to build up your relationship on the ground. 1) Endorphins – when you laugh it releases endorphins – so, as we can guarantee you WILL laugh, you will get some of those lovely endorphins that make you feel so great – simple! 2) Social – we can’t help but natter in between games! 3) Dressage moves! Yes that’s correct; you may be surprised when your horse shows his/her natural ability to do flying changes in the bending race and an extended trot in the trotting race! 4) Reduces spookiness – we use a variety of objects in the games and the exposure to these will helps them cope when they are unsure about similar objects in the future. 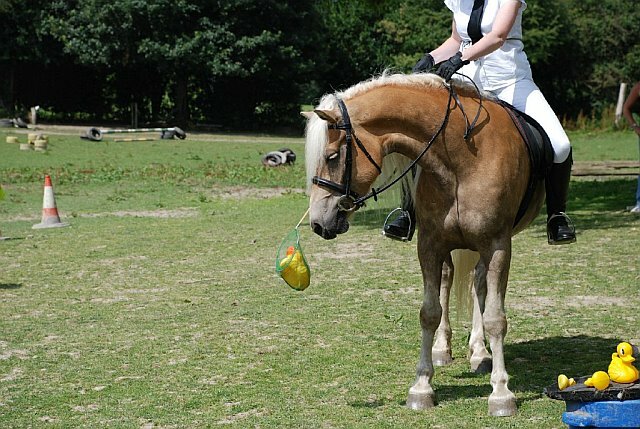 5) Active mind for your horse – if I did the same thing at work every day, I’d soon get very bored and I’m sure horses are the same – they need to have different activities to keep them active in their thinking. Come along and see how much the horses love participating! 6) Riding Confidence – believe it or not, when you’re so focussed about getting the ball in the bucket without it bouncing out, worrying about falling off your horse disappears from your mind! 7) Team spirit – we compete in small teams, so encourage each other as we go along. 8) Co-ordination and balance – dealing with a range of movements within the games helps you improve your natural balance (this often happens unconsciously), and your hand-eye co-ordination improves as you handle objects. 9) Transitions – you will find an improvement in the communication between you and your horse and accurate transitions are important in the games. I have easily achieved halt to canters through games, as my horse has more energy and impulsion; in schooling sessions we find it harder to achieve. 10) Chocolate – for the winning team, say no more! So… why not give it a try? We limit the numbers in each session to ensure we have enough room in the arena, so booking is a must. Keeping checking the events calendar for future dates.